~ by kellig on August 24, 2014. Nice, job. It turned out great for your first guitar and I love your design. That’s wonderful. Thanks for posting. I was wondering how you change the rope light if it goes out? i used clips to attach it, and have a flap cut into the back. the LEDs should last for a very long time, but it will be fairly easy to switch it out when they do die. 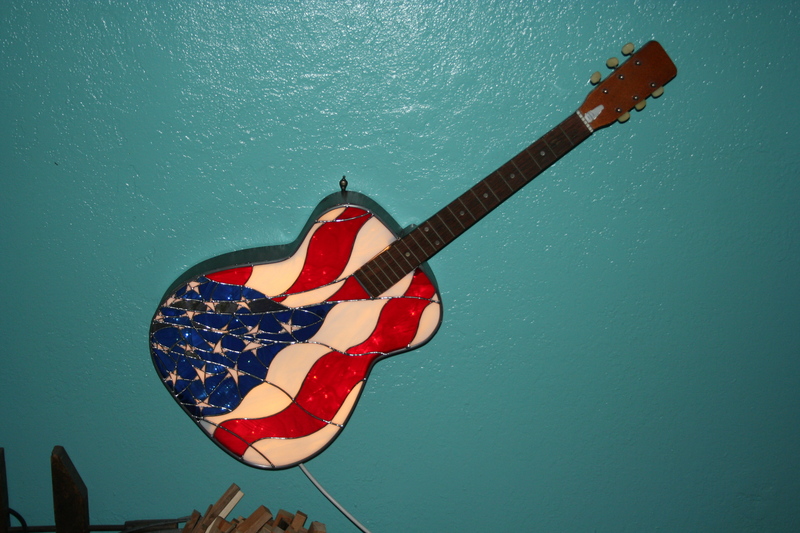 Do you have an more stained glass guitar lamps for sale or can you make another one? Hi Jos, thanks for the looking, and welcome to the obsession, lol. FRaming provides structure and stability to the piece, so yes I do think it’s necessary. 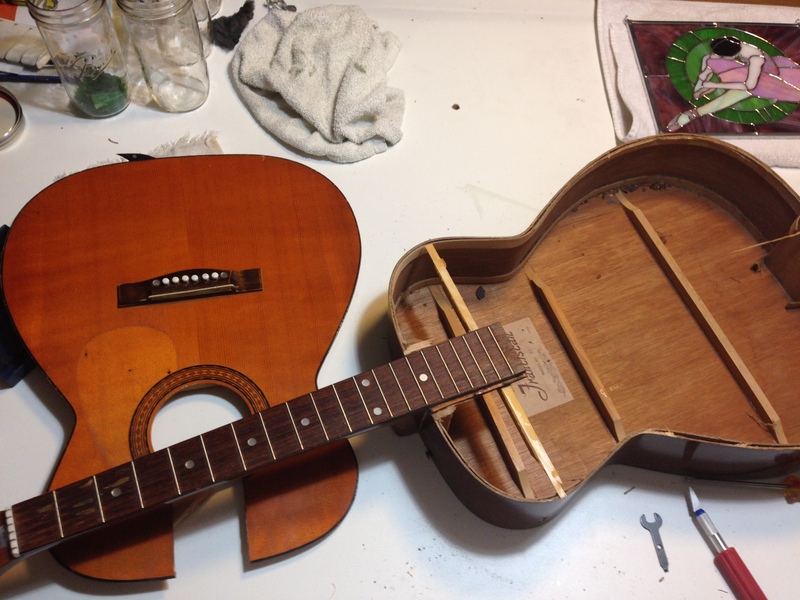 i also think it looks better with the finished edge, and it is certainly much easier to adhere to the guitar frame. I used E6000 adhesive. good luck! Thank you for your tips. I am finally going to be trying this this weekend. So you use epoxy to attach the glass? This will be my first guitar and nervous but excited. just had to sat wow..what a great piece..lot of work there..would love to make one…how do i start………..
thank you! it was a LOT of work, but the end result was so fantastic. 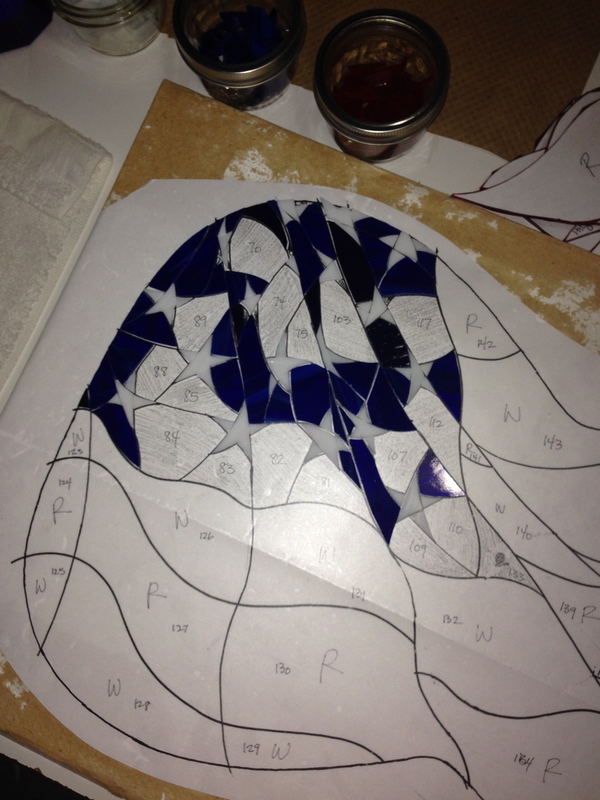 I love the pattern which you can find by googling ‘american flag stained glass pattern’. i think it was a free spectrum pattern. 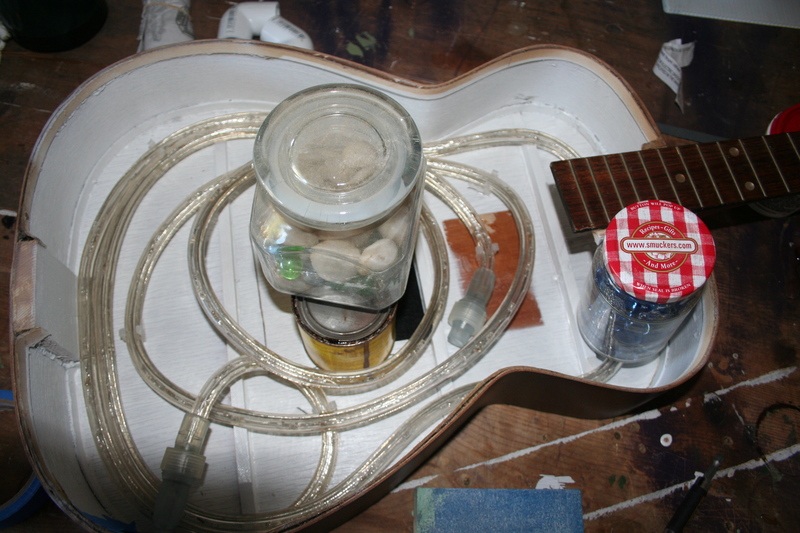 how to do the process of making the guitar lamp is quite involved and too lengthy for me to type out here. there are several excellent how-to videos on youtube. 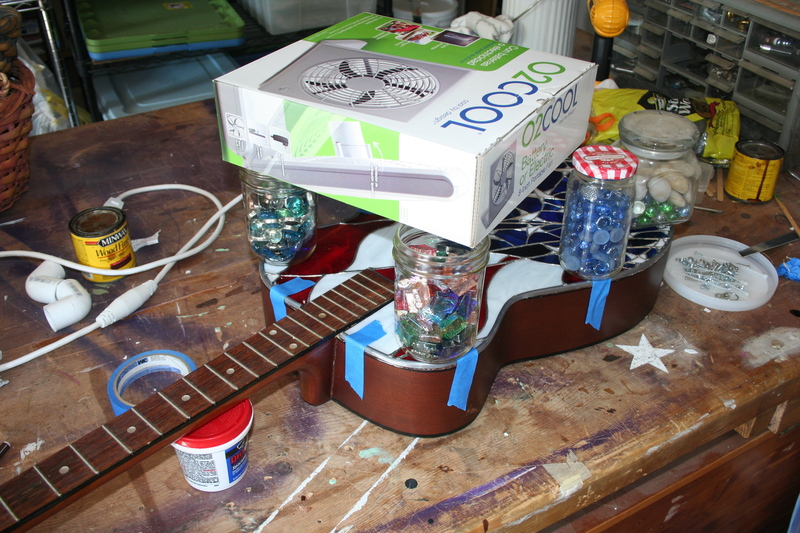 type in ‘how to construct a stained glass guitar’, several pop up. watch all of them and see which one resonates with you. good luck, and i’d love to see the finished product. you start with a basic class in stained glass copper foil method. that will teach you how to do the work. after that it’s practice and trial and error. great job! 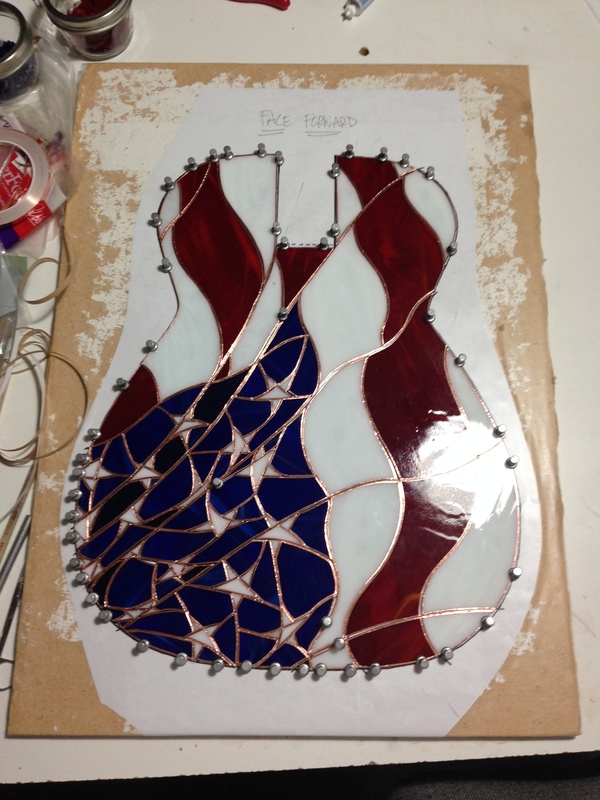 I started experimenting, and making stained glass guitar lamps about 2 years ago. It has definitely been a process of watching some You Tube videos and just trial and error. I have made 10 guitars and 1 banjo. It shows that you love what you are doing. thanks marks glass. its a great art form, isn’t it? I’ve got three guitars that are waiting for me to have the time to work on them. I haven’t tried a lamp, per se, but just wall art. thank you!! I have a couple guitars sitting in a closet, waiting for me to get to them. I wish I was able to work with glass more than I currently do.